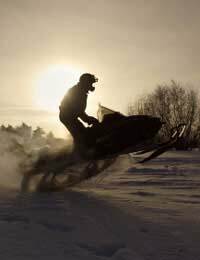 Home > Safety > How Dangerous is Snow Mobiling? On the face of it, although it’s great fun, hurtling through snow and ice on a vehicle that gets up to speeds of 70 miles per hour has got to have an element of risk involves. While it’s a great way to see the areas that you can’t get to by car, snowmobiling can lead to danger, and there is a risk of serious injury if safety guidelines aren’t followed. Just How Dangerous is Snowmobiling? One study in New Mexico found that snowmobile riders are an incredible nine times more likely to be hurt or even killed in an accident than car drivers, based on mileage. The main cause of death for snowmobile riders is a collision with another stationary object, but the second highest cause of death is actually drowning. Snowmobiling in one of the top five most dangerous sports, and it’s not just the driving that causes problems. Mixing snowmobiling with alcohol, driving too fast, unsafe conditions, not knowing the area and not knowing how to use the equipment are also issues.There are different laws in every country (and even different states in North America or Canada have their own laws) about snowmobiling, so familiarise yourself with the laws of the place you’re heading to before you set foot on your snowmobile. Make sure that any snowmobile you are hiring has had a thorough safety check before you ride it, and make sure you familiarise yourself with it before you set off. If possible, ask for a test run to see if it suits you, and if you feel comfortable driving it. Most reputable hire outlets will let you do this. Always wear a properly fitted and good quality helmet when you go out snowmobiling. Snowmobile helmets are really effective in preventing serious head injury and even death if you do have an accident. Goggles or a face shield are also recommended to help you protect yourself against any flying debris. Slow down is left arm out, slightly angled towards the ground with your elbow tipped outward. Always tell people where you’re going, and when you expect to be back, especially if you’re not on an accompanied tour or ride. Take a mobile phone with you just in case you get separated from the group or have an accident, and always travel together with someone. Don’t even think of drinking before you go out snowmobiling. Stay away from alcohol and drugs, as they can both slow down your reactions and impair judgement. Alcohol is said to be the number one cause of snowmobile related accident, especially because when it’s cold, alcohol causes your body temperature to drop much faster than it would usually do, which makes you more susceptible to hypothermia. Watch your speed! Especially if you’re new to snowmobiling, driving faster than you should increases your risk of an accident drastically. If the weather starts to deteriorate, you also need to slow right down. Always allow enough room between your machine and other people. As with driving on-road, not leaving enough room leaves you with less reaction time. Snowmobiling is great fun and a good way to see more of your surroundings when you are on a winter holiday – but it is a dangerous pastime so if possible make sure that you go on an organised group, and stay safe!